For as long as people have been buying guitars, their purchasing decisions have been influenced by other players. The whole idea of a signature model is a testament to this, as are the many websites and forum threads devoted to dissecting exactly what instruments different rockstars are playing at any given point. In cases where players prefer lesser-known vintage instruments, the embrace of a particular model can lead to increased awareness, interest, and, ultimately, pricing on vintage specimens. In the late-'60s, for instance, Keith Richards and other British blues rockers started playing '50s Les Pauls. Gibson wasn't even making the Les Paul at the time, but many cite this renewed visibility as a key reason the model was revitalized. This dynamic of players reigniting interest in a vintage guitar is still very much alive. It sends ripples through the used market, and, in some cases, even leads to reissues of designs that had previously fallen out of the popular guitar consciousness altogether. Today, we're taking a look at four modern players whose use of a relatively unknown vintage guitar helped spark new interest in the model, dragging up vintage prices along the way. Jack White and The White Stripes burst onto the scene in the early 2000s, bringing a unified red-and-white aesthetic and a raw, back-to-basics rock sound to the pop charts. Through the band's whole run, Jack primarily played one electric guitar: a 1964 Airline Res-o-glass guitar that in guitar circles is often called the "J.B. Hutto" or "Jetsons" model. 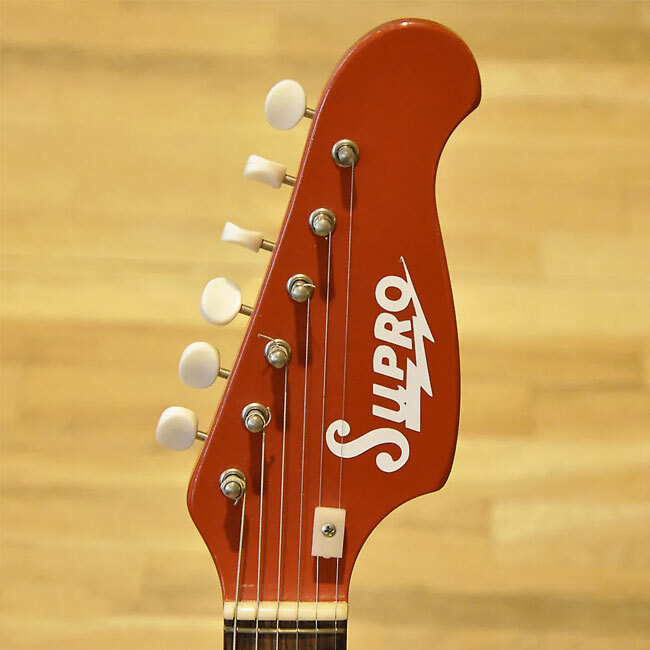 These instruments were built by the Valco corporation in the '60s and branded as either Supro or Airline when being distributed by Montgomery Ward. Their bodies were made of this plastic "Res-o-glass" material, with a block of wood down the center and an edge of bright white binding tying the back and front of the body shell together. These were somewhat rudimentary guitars. The pickups were single-coils disguised to look like humbuckers, and the neck housed just 20 frets and no truss rod. 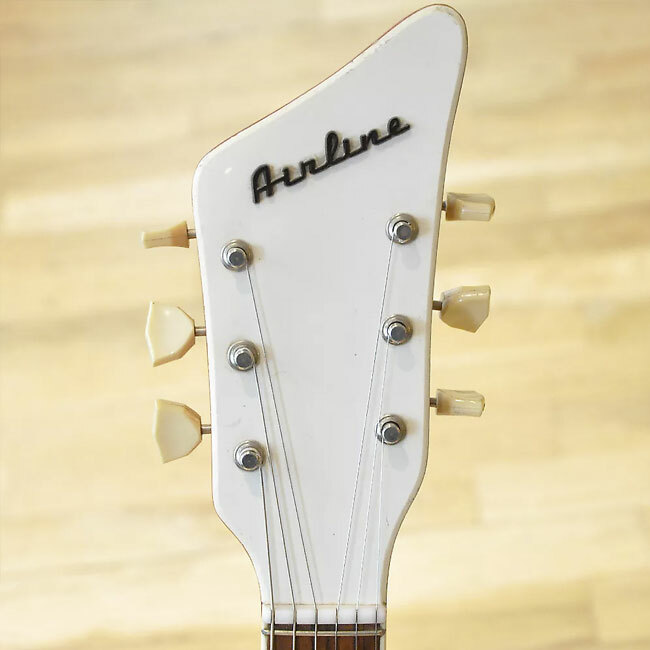 While certainly rocking a sleek visual vibe, the Res-o-glass Airlines were never considered highly coveted vintage instruments, but were viewed more as a neat curiosity than an in-demand model. But for Jack and The White Stripes — a band driven by unrefined sound — the guitar was a perfect match. When asked about the instrument in a 2004 Guitar World interview, Jack recounted buying his Airline from another guitarist on the road. "I had, like, 200 bucks or something… Can't get 'em for 200 bucks anymore!" He goes on to describe the way in which playing lower-end, unpredictable instruments suits his performance style. "It's work to play it, but I like that. …If I wanted to play it safe I'd go out and get a brand-new Stratocaster or something like that. But I don't like to play it safe; I like it when things are getting messed up. It's like when things get messed up onstage. It forces me to figure out something now, because no one else can save me. With a guitar like the Airline, my mind is always working." Jack's Airline is the literal centerpiece in the video for the band's megahit, "Seven Nation Army"
As Jack reflected in the interview, you used to be able to to buy these guitars for less than $500 USD. In the post-White Stripes era, though, prices on these specific vintage guitars have ballooned to more than $2,000 USD and higher in many cases. 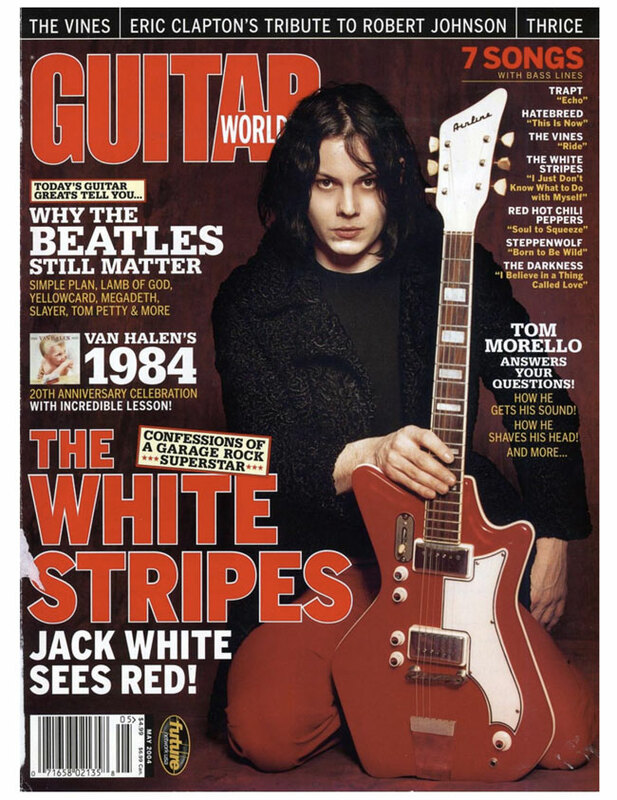 The popularity of The White Stripes happened to coincide with the mid-2000s boom in the vintage guitar market, which was certainly part of this drastic climb. An important note with the Res-o-glass guitars is that there are a handful of different models out there, all of which have experienced something of a lift from the Jack White effect. There were multiple body shapes made out of the Res-o-glass material, distributed under different brand names, and sold with varying headstocks, among other specs. Many of the models were produced 3/4-sized, with a shorter scale length, and these examples are far less desirable to collectors. The core Jack White model, though, is the red, angular Airline with two pickups and a slanted white headstock. Guitars that match these specs exactly tend to command the highest prices on the used market. As Jack has moved onto new projects and instruments, prices on these guitars have cooled off a bit but still consistently sell for near that $2,000 USD mark. Eastwood currently produces a variety of reissues of this model. 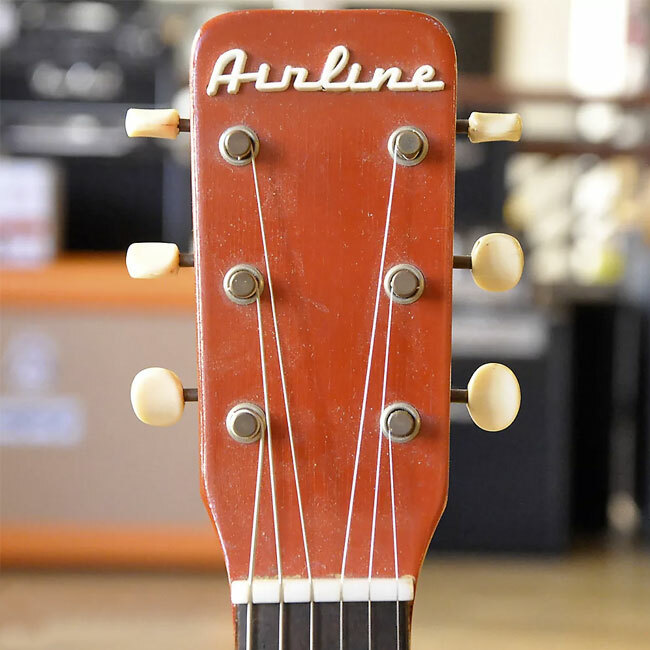 The one called the Airline 59 2P is the one that most closely matches Jack's guitar. Like Jack White and his Airline, the vintage guitar most closely associated with Annie Clark (aka St. Vincent) finds its origins in department stores and mail-order catalogs of the 1960s. Unlike Jack though, Annie's playing is anything but "back-to-basics." Her exploration of new effects and penchant for cloaking guitar tones in dense, synthy textures has made her a guitar hero to many. It's all the more remarkable that she was able to establish her sophisticated sound and playing style using guitars that have historically been viewed as thrift-store faire. The guitar in question is, of course, the Harmony Bobkat, specifically model H15V (the V signifying the crucial vibrato arm). 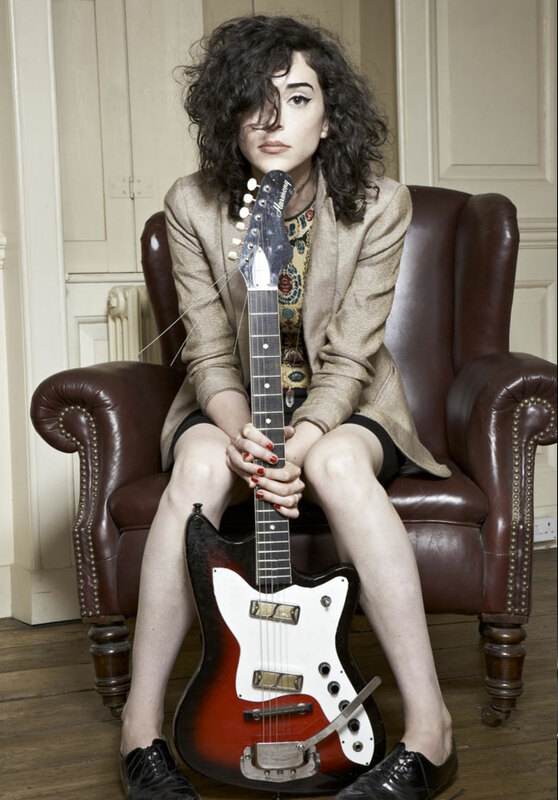 For years, prior to collaborating with Ernie Ball Music Man on her St. Vincent signature model, Annie toured and recorded with Harmony-built Bobkats through an ongoing string of popular solo records, along with collaborations with the likes of David Byrne. As the press surrounding her new album Masseduction demonstrates, St. Vincent is a highly visible musical endeavour and the image of Annie with her trusty Bobkats has been a fixture of hip music blog, festivals, and late-night TV spots for years. In a 2012 interview with Guitar Player, Annie described her affinity for these instruments: "I own two of those guitars and they are surprisingly solid. Once they are set up with .011s, they stay in tune pretty well and you can really go to town. The tremolo arm is the real secret weapon of that guitar. You can really dive bomb stuff — one of the guitars is set up to go down a fifth or so." Harmony made a lot of these guitars, both under their own brand name and with Holiday or Silvertone on the headstock when being sold through Sears. They remain quite common on the used market, and, up until the past decade or so, it was easy to find these and other offset department store models in the wild for around $100 USD. Today, the specific model that Annie uses — with two goldfoil pickups and a tremolo arm — have gone up in price to the point where guitars in excellent condition are selling for more than $600 USD. The single-pickup iteration can be had for less, but is still commanding prices markedly higher than historic norms. This upswing is part of a larger trend of increasing prices on junkier vintage instruments, though demand for this whole class of guitar has cooled off a bit this year, after years of steady rise. While clearly part of a broader movement, in the case of the Bobkat it could also have something to do with the release of Ms. Clark's signature model from Ernie Ball Music Man in 2016. These are fantastic instruments that are significantly more solid than any old Harmony, and you can understand a St. Vincent fan opting for one of these over an old Bobkat. 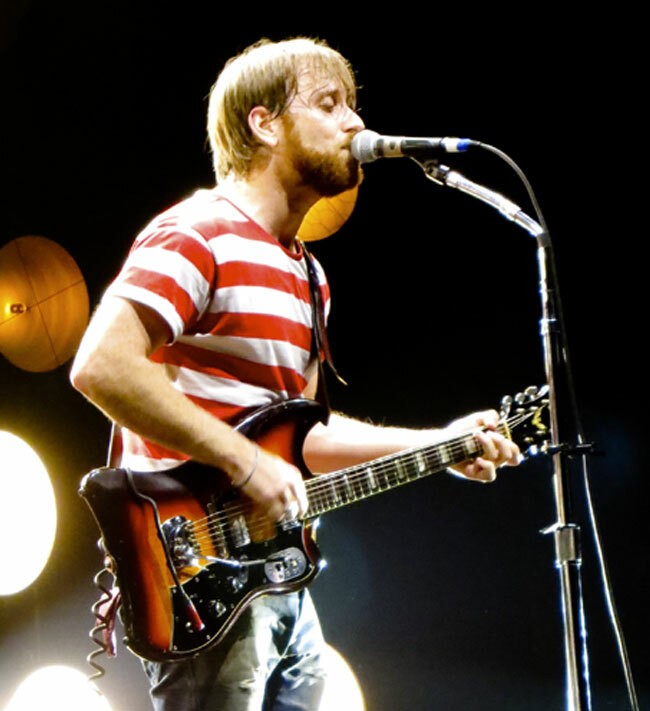 As one half of The Black Keys, Dan Auerbach's reputation as a modern guitar icon has risen substantially in the past decade or so, especially in the wake of the release of El Camino in late 2011. Many guitarists cite Dan as a key contemporary influence owing to his savvy production style, intriguing tonal palette, and blues-driven rock riffage. This admirably open-minded philosophy aside, there are a few key models that have come to be most closely associated with the Akron-based tone slinger. His mid-'60s Guild S-200 Thunderbird sits at the very top of the heap. Unlike the aforementioned Harmony Bobkat, the Guild Thunderbird was never a wholly dismissed guitar. But since Guild electrics have never earned the same iconic status or pricing competitiveness as similar guitars from Gibson or Fender, historic values were typically rather modest. Since 2010, though, prices on the S-200 have risen noticeably, with some pristine models reaching upwards of the $6,000 USD mark. There are a few reasons for the increased demand for this model. Guild guitars in general have earned a reputation as underrated, and more players are seeing them as a worthwhile vintage buy across the board. Additionally, with its curvy body shape and tremolo arm, the S-200 is in the same general ballpark as a Fender Jazzmaster, so the broader increase in the popularity of offset guitars may be fueling interest in the S-200 to some degree. Furthermore, Guild only made this model for a few short years, and as I've written about before, the included kickstand on the back of these guitars led to frequent breaks, it's difficult for ambitious collectors to find one in excellent condition leaving supply consistently low. Even with all these factors considered, the guitar’s usage by Mr. Auerbach has definitely been part of the equation. Dan has rocked his Thunderbird in multiple Black Keys music videos and TV appearances, repeatedly broadcasting the image of the rare vintage Guild to his fanbase. In 2016, the current incarnation of the Guild brand reissued this guitar as the S-200 T-Bird. This is the first time this model has ever been reissued, which is something that wouldn't happen if increased public interest didn't justify it. 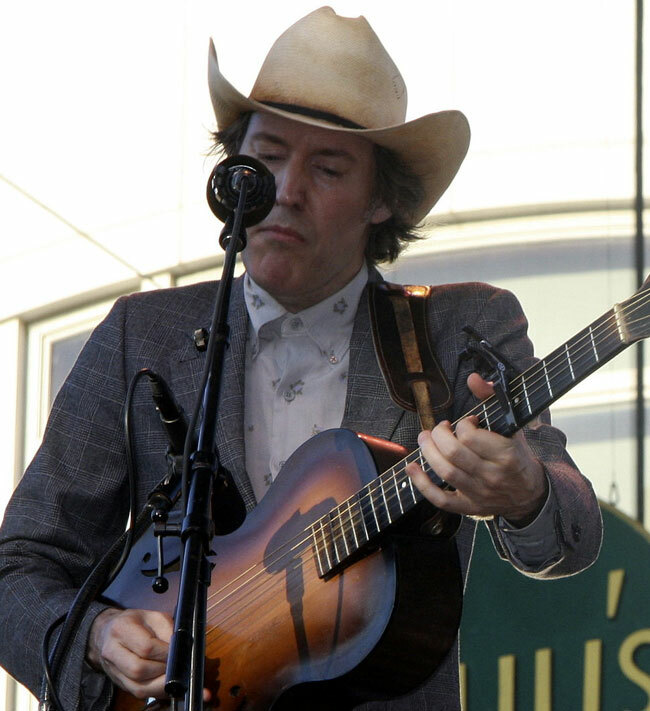 With his musical partner Gillian Welch, Dave Rawlings has become one of the central players in Nashville's "Americana" scene — although that's a genre designation the pair would probably dismiss. Fueled in part by their participation in the soundtrack for O Brother, Where Art Thou?, the duo have earned a devout following, headlining sold-out tours and folk and bluegrass festivals both under Gillian's name and as members of The Dave Rawlings Machine. Seeing Dave play live is a revelatory experience for any guitarist. His playing is not about flash or virtuosity (though he possesses both), but about how he brings a rich melodicism and sense of counterpoint to complete every song. He plays long lead lines that don't feel like solos so much as they feel like unwinding stories of sorrow and nostalgic musical longing. Since their first album, Dave's guitar of choice has been a small-bodied, mid-'30s Epiphone Olympic archtop that he found covered in sawdust in a friend's garage. It is the perfect tool for his playing style, with excellent balance and a tight, focused tone that cuts through Gillian's rhythm parts like a compressed Telecaster stabbing through a dense country mix. As he explained in an interview on Epiphone's website, "On my little Epiphone, the low E open has about as much volume as something high up the neck on the top E string. It's incredibly balanced. And I had never played a guitar before where I would be soling and I'd find a spot and say ‘ugh, it's no good here.’ That guitar [the Olympic], however good it is, is good across the board, so it gives you a tremendous amount of freedom when you're playing." For an illustration of Dave's impact in the market, we can look to pricing on the specific era of Epiphone Olympic he plays. In the '30s, the exact specs of the Olympic changed a bit, upping in size from around 13” across to closer to 16” in 1936 or '37. It's the earlier, smaller-bodied versions that have increased in price the most since Dave entered the scene, and despite being a lower-end model originally, these remain some of the more in-demand Epiphones from this period. These days, an Olympic similar to Dave's will likely sell near the $2,500 USD mark. While for aspiring Rawlings emulators, the Olympic will always be the guitar of choice, on tour with The Dave Rawlings Machine this year, Dave brought out a new larger-body D'Angelico archtop to complement the smaller Epiphone. As prices on original D'Angelicos are already extremely high, it seems unlikely that this will have any real impact on the market. You can read more about the guitar in this article from the fine folks at Fretboard Journal. For those interested in the smaller bodied guitar though, Epiphone recently reissued the Olympic as part of their Century series, along with some other old-school archtop models. Have you ever hunted down an obscure vintage guitar because you saw a player you admire using it? Let us know in the comments.